In an image and media dominated age, where immediacy and encounters with distant others are legion, what kind of imagination makes up our global psyche? How are we invited to think about others, and in the process ourselves, and what does it tells us about media, identity and our global world? These are the core questions of Shani Orgad’s latest book – the work of several years of intense, detailed and original research. The Global Journal met the LSE senior lecturer in Media and Communications to talk about the limits but also the potential of imagination in an increasingly mediatized global world. And to see what lessons Global as a media outlet can learn from some of the finest academic research in media studies. 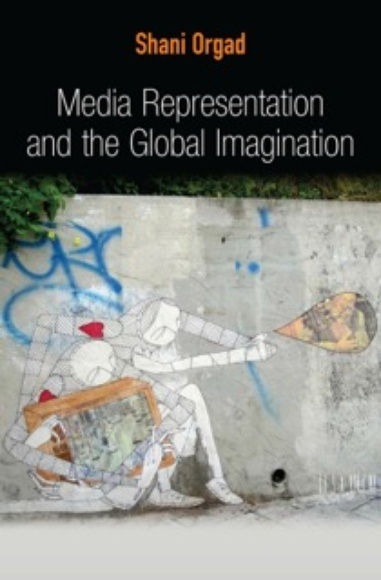 What are these media representations that your book is concerned with and how do they shape a global imagination? I am interested in the archives of images, narratives, notions and ideas produced by media that are being accumulated and absorbed in our mind. I am not referring to a direct relationship by which, for example, a TV program simply gets into our imagination archive that we then use. Rather, what concerns me is the cumulative process by which images and the ways we are invited to imagine feeds into how we see the world, ourselves and others. My understanding of representation is dual in that I look and analyse the objects produced by the media but I also constantly reflect on what kind of reality it tries to capture and how this feeds into the way we imagine the absent. Imagination is the capacity to form mental images and concepts of what is absent. We encounter images and narratives in the media, and we are able to fill the absent – what is not there - with some kind of a mental concept or image. This is where imagination comes in. Media producers both imagine and produce representations and we as viewers both consume and imagine. Through media and representation, we self-represent ourselves, others and our world. I deliberately didn’t frame the question of imagination as a one of thinking. Not that I exclude the question “how the media shape the way we think about the world”. But imagination allows capturing a much more dialectic and complex idea that includes the cognitive, but crucially also the affective, the emotional. We often imagine something before necessarily knowing it. Sometimes we need to imagine things that we don’t know, that we have not encountered personally. The argument of the book is that we live in a world full of uncertainties and that we should allow a space for our imagination to accept that. And for the media to more proactively provide this space of ambivalence; a space that would allow us to admit that not knowing and not fully understanding are inevitable features of life today. How did you go about addressing the two challenges of technology and globalization in the book? Technology is the propeller of the process of cultural globalization that I am interest in. The opening of the book - using an advertisement from the 1950s - puts at the heart of the discussion the technological force behind the shrinking of distance, and its consequence: bringing the far away to our ‘here and now’. The process of imagining far-away others, events, and places depends on technology. Of course we can imagine independently of media technologies but what interests me is how our imaginations are fed through representations that are produced and disseminated by technology. So technology is at the background, but underpinning this story. With regards to globalization, it’s probably a mark of my own history and entry into this debate, for I came to London in 1999 when Anthony Giddens was the Director of the LSE. Many of us, me included, were very enthused about the ideas of globalization and the global world. And of course, at the same time, quite a lot of doubts and questions started to be raised: do we live in a global world? Is it really globalization? The schism, that is not always helpful, between the national and the global started to be pronounced quite vocally. To me, the spaces of intersection between local, regional and national spheres of representation and imagination constitute significant spaces, within what I regard as ‘global’. Discussions within national spheres about how are we being seen in the world, what the world says about us are relevant questions to address in the process of globalization. They are of course national discussions occurring in the national sphere and shaping national imaginations, but they concurrently implicate the way we imagine ourselves as part of or in relation to the globe. It is therefore unhelpful to think about these only in terms of the national and national media. I have tried to distance myself (normatively, that is) from celebrating or embracing cosmopolitanism. In the book I address cosmopolitanism as an ideological project, not as an empirical reality. The issue of migration, for instance, is one where the local –within national spheres - is clearly the result of a global process and a response to global pressures. The centre of my interest in globalization is therefore as a cultural rather than economic process– notwithstanding the fact that economic processes underpins a lot of what I am looking at. But what has driven me is a curiosity about how globalization manifests itself in the cultural realm, beyond the homogenization / heterogenization argument. The book is neither a utopian nor a dystopian account of the consequences of cultural globalization. Rather, it is an empirically-grounded exploration that suggests, following Arjun Appadurai, that one of the central forces that propel globalization is imagination, and asks what possible effects it might have. The book concludes with a discussion of the “self” that is located in a global context. I show how global and national “public issues”, concerning war and conflict, humanitarian disasters, and migration, are explained and imagined in the media by a focus on the self, often in the form of the story of an individual’s intimate life. I argued that the focus on the personal and the intimate invites deep and meaningful engagement with the issue and potentially fosters interest in the other. At the same time this focus in the media on the individual encourages an inward, self-centred view, which fails to invite opening up to the world outside us, and to contemplating alternative lives to the ones we lead. You write: "What I discuss as occurring within the current media environment is that the ethnocentric, largely western 'we' is changing, specifically because groups and individuals who previously were excluded from the public media space are gaining visibility and voice, a process which is calling into question the symbolic frontiers between 'us' and 'them' ". Can you give some examples of such appearances in the global media landscape and talk about their significance? One of the case studies I am looking at in the book is the 2005 French Riots in Paris’s suburbs, but the broader argument applies to many other cases. You could look, for instance, at the Arab uprisings. The key process I discuss is the way in which formerly “others” enter the public sphere by gaining visibility and voice, those that were and still are to a large extent relegated to being ‘exotic others’, be them the “Arabs” in the Arab World, or the suburban youth, particularly of Maghrebi descent in the case of the French riots. These “others” have the capacity today more than ever to voice themselves on mediated stages that can become very quickly global – through, for example, online and social media, and international news networks. In the words of a French blogger: “Finally the microphones are pointed towards us”. And it’s in this reversal moment - without being too utopian about it for of course it has its limits – that these youth, who were historically excluded from French TV screens, eventually gained a voice, on BBC world, Reuters or Al Jazeera. This kind of moments challenge both the sense of the nation as a stable category but also the sense of “us” as Western viewers and our relations to those often impoverished “others” that have been historically shown in ways we have become so used to. These moments of reversal, however brief, may not always seem meaningful and they assuredly need to be cumulative to have an effect, but I believe they contribute to a process of opening up, which, in its most extreme form, I call estrangement. As an international magazine dealing extensively with global issues and which interacts a lot with NGOs, media and public communication practitioners, we are very interested in hearing some of your ideas about how the media industry can contribute to a different global imagination and for instance your ideas of ambivalence and non-narrative structure. I have had a lot of discussions with NGO communication people and journalists working about humanitarian crises and war. To their credit, the majority of them are highly aware of the pitfalls of what they do and are reflexive of many of the consequences of the representations they produce and how they feed our imagination. More awareness and reflexivity is already a great step – despite an economic media climate that favours certain stories and styles and delegitimizes others. But taking risks, being innovative and refusing to fit in existing categories have quite often made an impact and propelled some important changes in how people and places are represented. The technological developments we are witnessing of social and online media, and the increasing visibility open up a possibility to have a more ambivalent media space; a space that includes stories that allow the assigning of an object or an event to more than one category, or stories that are unable to categorize some things at all. I draw on Zygmunt Bauman in referring to the idea of ambivalence. I am not calling for reversal of global power – as can be seen, for example, in the narratives about Asia as “the next global power”. These narratives are locked in familiar categories of financial power and empire. They fail to offer other formations of global relations, that wouldn’t necessarily fall into the familiar categories that ultimately reproduce inequalities. Certainly, we need narratives, we need clear explanatory accounts that help us to cope with the constant uncertainties, fragility and lack of coherence of our times. Narratives work to impose symbolic order on the modern experience which is fraught with ambivalence and anxieties. At the same time, I conclude the book by arguing that we need symbolic spaces to articulate the contradictions and tensions brought by modern life in a global world, by the disembedding of social relations from their local contexts. We need representations that allow us to ‘live with’ ambivalence and to accept incompleteness, lack of closure and moralizing. Take the case of migration. As a migrant who arrived in London in 1999 I have experienced contradictions, ambivalence and uncertainties, just like many other migrants. When I researched representations of migration for one of my chapters - in various contexts from Chinese press representation of local migrant workers, other Asian countries, as well as North American and European contexts – I was hoping to be surprised and to be able to say to many previous studies: “you got it wrong, the representation of migration in the media is not always about either criminalizing migrants and victimizing them, or celebrating the promise and benefits of migration. But sadly, my research confirmed this rigid representation, which I call nightmare and dream ‘scripts’ of migration. In contrast to these rigid scripts, the experience of migration is ambivalent by definition. It is fraught with uncertainties, dilemmas and the inability to categorize. You can be away from your home country all your life and still experience this ambivalence, and this ambivalence needs to be negotiated sometimes on a daily basis. Where is there space in the media today for articulating this negotiation? We have a topic here – migration – where the reality of people’s experiences refuses narrativity because it’s so complex and full of contradictions and yet the majority of its representations that we encounter in mainstream media – as well as in online and social media – insists on categorizing and narrativizing, and refuses to acknowledge this ambivalence. I am not simply saying that everything is uncertain but that media representations should document and explore these uncertainties. So my hope is that media professionals – journalists, editors, producers, bloggers, social media users - would take this into consideration, despite the logistic, technical and aesthetic constraints, the process of production, and the impetus of news and other media genres to impose closure, that work against ambivalence. I do believe that media representations can become a vital force in re-educating our imagination in this direction.